Today's selection is a vertically-oriented composition, unusual for Dorgan, but like his other drawings from this period is executed on a roughly cut 9"-ish x 12"-ish illustration board. This panel cartoon was featured as one of 16 illustrations in Nellie Revell's memoir Right Off the Chest, published in 1923 by the George H. Doran Company, New York. 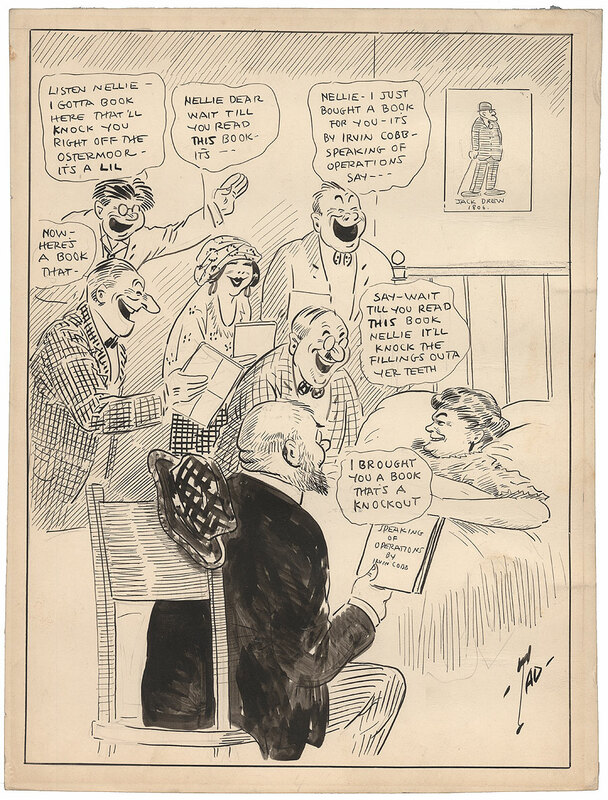 You can see this book in its entirety, including excellent cartoons by Rube Goldberg, Grace Drayton, Abe Hershfield, and James Montgomery Flagg, here. Nellie Revell was a remarkable woman, a hard-bitten journalist, successful Broadway press agent, and an all-around multimedia personality wrought large. You can read an interesting summary of her life and career here. Her life in the late 'teens paralleled that of Tad Dorgan's: both were on career overdrive, crazily prolific, and both were heading towards disaster. It struck Ms. Revell first, in 1919, when Nellie, beset by overworked exhaustion and a disastrous financial investment gone wrong, suffered some kind of sudden, acute spinal injury which caused her to be hospitalized, flat on her back, for over four years. Right Off the Chest, in fact, was written during her convalescence, and it's quite a tale. Tad's cartoon illustrates an anecdote told by Revell in the book. Nellie was still a popular New York socialite during her lengthy recuperation, the only difference being that the celebrities and glitterati came to her in the hospital to entertain her and pay their respects. Many of them gave her copies of celebrated humorist Irvin Cobb's Speaking of Operations, his best-selling take on hospitals and doctors, not knowing that Cobb was already one of Revell's best friends (he wrote the introduction to Right Off the Chest). Tad's drawing shows grinning Nellie receiving six copies of the book from a coterie of well-wishers. Revell fought through her illness and lived to have a brilliant career until her death in 1958. Tad Dorgan wasn't so lucky. As I mentioned in this post, Tad, like Nellie, also worked himself practically to death in the late 'teens, culminating in a series of cardiac events in 1920 and 1921. By the time he drew this illustration for Ms. Revell in 1922-3, he had already been banished to his own convalescence in suburbia. Unlike Nellie Revell, however, Tad never recovered, and just six years later he was gone. This is a sophisticated composition from Tad. As we've seen from the countless Indoor Sports panels I've posted here, the cartoonist tends to show his characters from head to toe, and from a mid-range distance, usually spread out in a line on a narrow stage-like space. Here, he's moved closer to the figures and grouped them together in a tighter arrangement, creating a much more intimate scene. Bedside scenes are tricky, and can end up looking like morbid banquets, an outcome deftly avoided by Dorgan. One detail is baffling and may be an inscrutable private joke between the artist and his subject: the picture on the wall labelled "Jack Drew 1806". The caricature is certainly of Broadway star John Drew, Jr. (Drew Barrymore's great-great uncle! ), but the date seems like a non sequitur. Then again, it wouldn't be the first time Tad threw a complete non sequitur (Yes, we have no bananas!) into his drawings. Thanks for that link - I am from that area and attended U of I in Sangamon County but did not know of her. I would hope my grandmother did - she was the owner/editor of three small newspapers along the Illinois River south of Peoria.